Cabelas Black Friday Deals for 2018! Cabela’s has released their Black Friday Deals for 2018. Here is a list of the best deals from the ad. Doors open at 5 am on Friday (Black Friday) Nov. 23th, 2018. The ad features some great doorbuster deals that are valid from 5am to 11am. Make sure to check out the deals online at Cabela’s, too on Thanksgiving/Black Friday, as many deals are often found online as well and that will save you a trip to the store in the rush on Black Friday. We have the full ad scans below as well as a Searchable database of all the deals in the Staples Black Friday ad. You can use this database to search by products or by categories to see all the deals in that particular category. 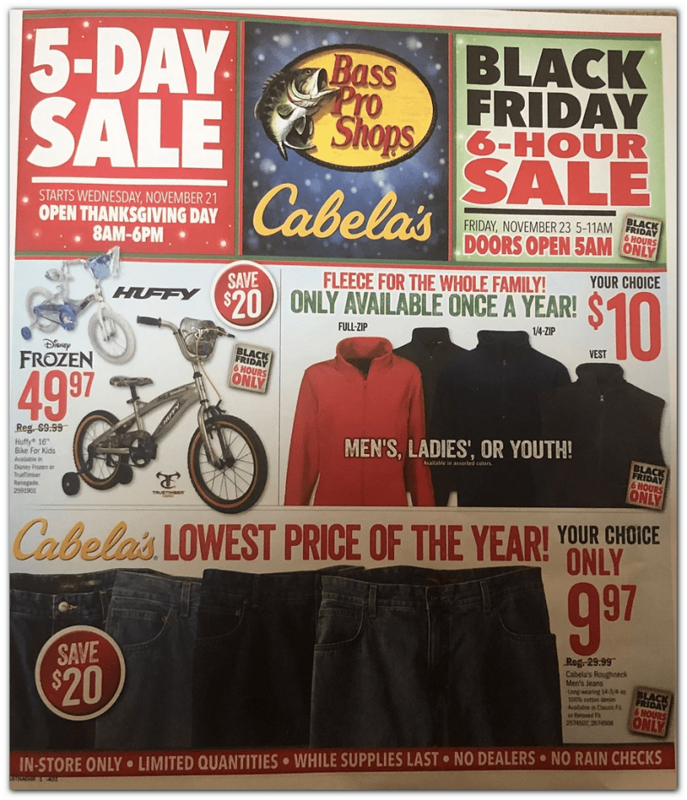 We have a special feature for some of the most popular stores featuring both the full ad scans, as well as a searchable list of all the deals you will find at Black Friday at Cabela’s. You can see the full list of deals or you can search in the search bar to find what you are looking for specifically or narrow it down to see all items in certain categories. This will make it very helpful if you are looking for a particular product or if you want to compare prices on items.